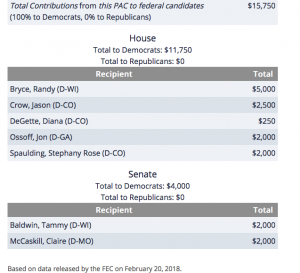 Democrats scream bloody murder whenever Political Action Committees (PACs) give money to Republicans. Dems despise the very existence of PACs, describe them as the devil’s tool and would outlaw their very existence if given the chance. Of course Democrats also take PAC money every chance they get, because they’re a bunch of charlatans. And now we see a new trend emerging from the Democrats that ranks at the very heights of hypocrisy. Cary Kennedy, Democratic gubernatorial wannabe, recently “won the endorsement” of a PAC called Blue Rising Colorado, which is a branch of Blue Rising. Both function purely as fundraising machines for select Democratic candidates. The object of a PAC is to raise money for a political cause, so Kennedy has essentially been “endorsed” by two political fundraisers, Dawn Reinfeld and Annette Moore. The Colorado PAC’s goal is to raise $5,000, but they’ve only collected $1,720. Not surprising for a two-person team and a Facebook page with only 300 followers. Their other PAC that raises money for federal candidates has raised just over $26,000 and only has about $4,000 left in the bank. While the two-woman PAC plans to “seek out women and diverse candidates as much as possible,” here’s who the federal PAC is backing. Not only did men get more money, but the measly donation to U.S. Rep. Diana DeGette looks downright insulting, like leaving a waitress a $1 tip for a $100 dinner.